Whether it is for the kids or the adults, there is one thing for sure! Blackjack is always a hit! Enjoy the thrill of being the big winner as you "beat the house" to win fun prizes. Is poker your game? We provide the tables, cards, chips, and dealers for a single table or tournament style play. Want something unique? How cool would it be to have the dealer of your game be the gentleman that WROTE a 560 page book about cheating at poker!? 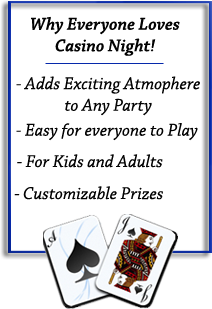 In 2010 John Born released Cheating at Texas Hold'em - A modern guide to the art of deception and illicit play at the card table. With Mr. Born at the table, you may learn more than just "when to hold'em and when to fold'em."